Room to Heal has reached a crucial point in our development. After ten years providing specialist care, we have developed considerable expertise regarding how to support survivors of torture, through a holistic, community-based model of assistance and are starting to share our model through training and capacity building internationally. Since 2014, Room to Heal has piloted a training programme in Tunisia for psychologists, social workers and lawyers at OMCT (World Organisation Against Torture) working with people who have been subjected to arbitrary arrest and torture under the Tunisian emergency powers legislation. After the first year of this work, the Tunisian Ministry of Social Affairs seconded their psychologists to be part of this programme, and have been involved for two years. Since October 2017, the Tunisian Ministry of Justice and Psychologues du Monde have also been involved, and the training programme has reached psychologists working in the Tunisian prison system. In this programme, we have supported the staff teams concerned in establishing and maintaining therapeutic support groups or “groupes de paroles”, such that they are able to work effectively with groups as opposed to working solely with individuals. We have achieved this aim by working with the various staff teams therapeutically (in much the same way as we would with a group of beneficiaries). This allows participants to gain first-hand experience of working in the group modality. 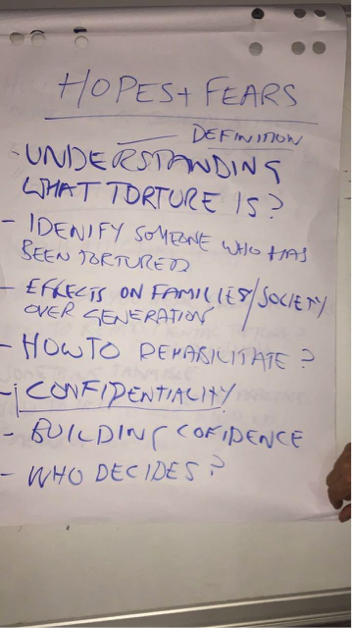 This experiential training allows participants to come to understand the benefits and challenges of utilising group work as an effective way of working with survivors of torture and the complexity of issues they bring. Typically, the training sessions lasts between two and three days. In Tunis, we return for follow-up trainings every 6 months. This allows for a sense of continuity amongst staff members and much needed ongoing support and supervision of their work. In March 2017, in recognition of the innovative nature of our community-oriented therapeutic model of working with survivors of torture, Room to Heal was invited to present our work at the second annual experts conference at the United Nations in Geneva. Shortly after the conference, the UN asked Room to Heal to provide training and support to the Prison Fellowship in The Gambia. We were able to complete a successful training on similar lines to the above and are looking forward to continuing this work in 2018. Working in groups is good for survivors of torture because it allows bonds of kinship and solidarity to develop – and this sense of belonging and fellowship (and the renewed meaning in life that it creates) does much to aid recovery. It is also good for people who work with survivors of torture, who have to constantly address the terrible and horrific traumatic events that survivors carry with them. The group modality of working allows staff teams to bond at a deeper level together, creating an environment of trust, where the often difficult and stressful realities of working with survivors of torture, can be properly negotiated. In particular, and of great importance, it also allows staff teams to acknowledge and address issues of vicarious trauma (the traumatic impacts and effects of working with traumatised people) such that they can develop strategies to cope with and manage such impacts more effectively. Supporting people who have survived torture and organised violence to rebuild their lives in exile. At the heart of our work lies the cultivation of a healing community through which people can overcome the legacy of their traumatic experiences. This is complimented by a holistic therapeutic programme and intensive casework support.